Gail is a long time artist who has worked in a variety of mediums from oils, photography to graphic arts, as well as owning a marketing business that focused on developing visual ads for her customers and designing and producing collector teddy bears. Gail's first encounter with wire was when someone suggested she crochet it - and as she had crocheted many projects from yarn and string, she tried it. After two weeks of struggling, it all finally clicked. She discovered bending and weaving in 2012 and was hooked (no pun intended)! She has now developed a deep and sometimes obnoxious love for wire and the latitude it affords for her artistic desires. 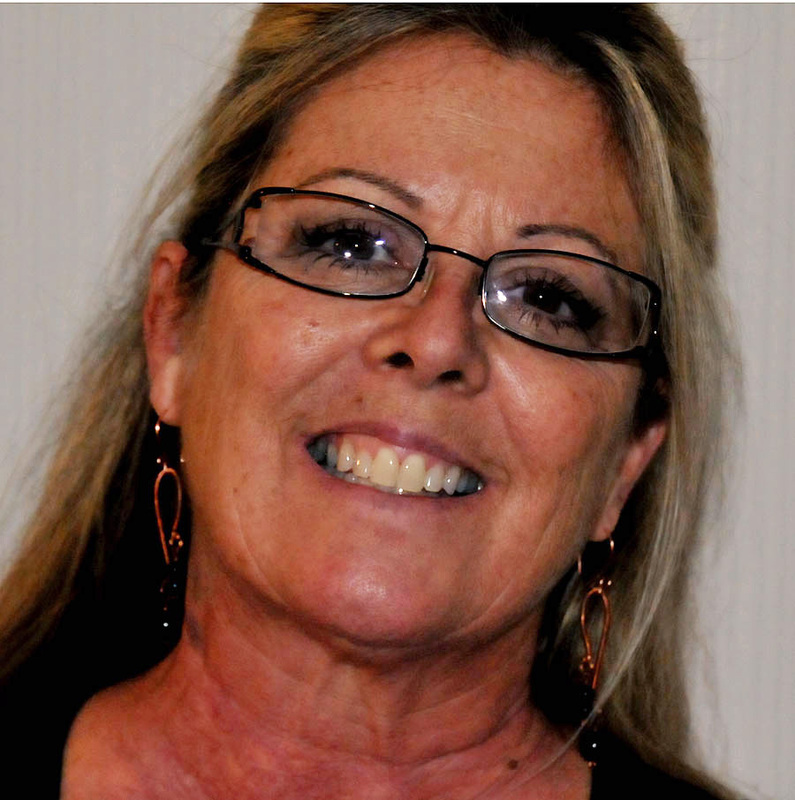 Gail has been designing wire jewelry for five years now works hard to come up with new and original designs constantly. Gail has recently been accepted to the Woodlands Waterway Art show in Woodlands, Texas and is thrilled! 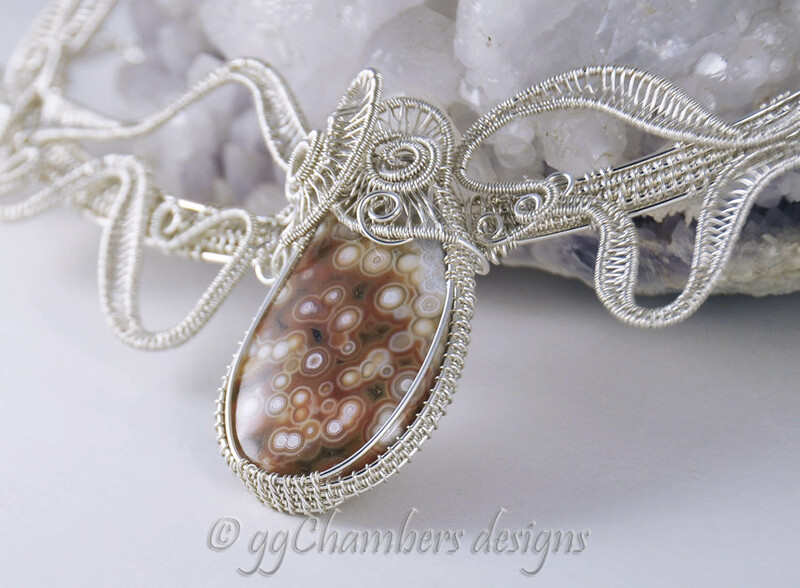 Her inspiration is her husband, Gary, their lives together, wire and the lovely stones that she works with. 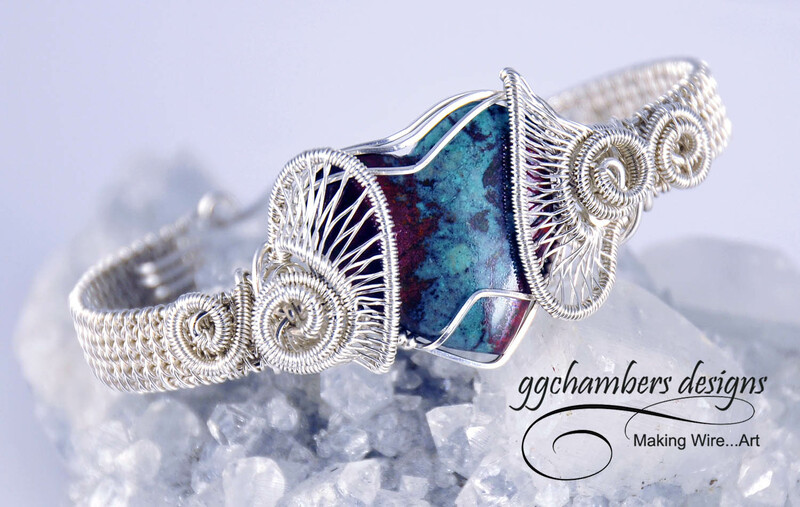 Gail and her husband work closely together in their business ggChambers Designs LLC to create beautiful jewelry and works of art which are a reflection of them. Along with her passion for wire came a new love, the love of the beauty of natural stone. While she sometimes uses unnatural materials like polymer clay or man made materials like Opalite, she always gravitates back to wonderful natural "earthy" stones and cabochons. 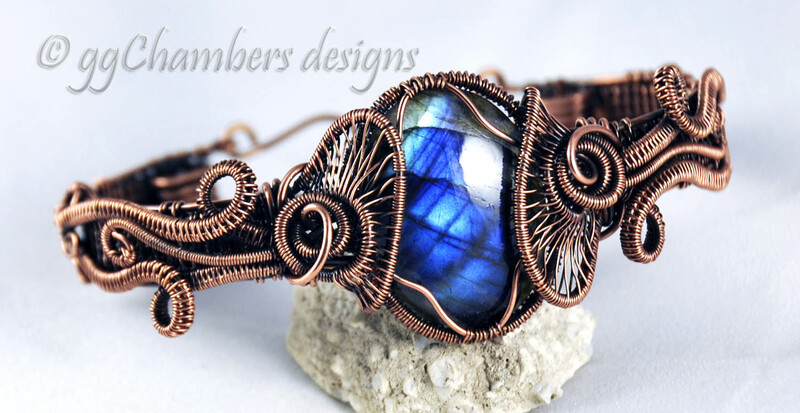 Wire Helix Bracelet - This piece is from the Wire Helix Series and is woven in copper wire and features a flashy multi-color Labradorite cabochon. Gail wraps/weaves the cabochon first and then sets it aside. Then the bracelet frame is woven and the pendant is attached to the frame with wire. The ends of the pendant are then used to make the woven freestyle accents on the bracelet band. She then stitches down the ends, which makes the bracelet sturdy and wearable. It has been antiqued, and sealed to help preserve the vintage appearance. Colorful Ocean Jasper is getting more rare, and in so, is becoming more collectible. This beautifully woven necklace is made of sterling silver with an adjustable handmade chain. The stone of Sonoran Sunrise is found in the Sonoran Deseret of Arizona and is comprised of the semi-precious materials of Chrysocolla and Cuprite. This lovely stone is cut and polished into a heart-shaped cabochon. 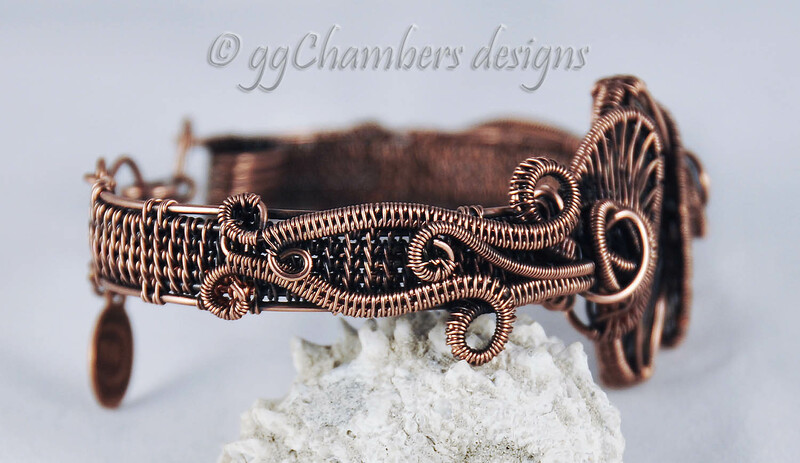 This was placed into one of Gail's first original designs - the Woven Wire Helix. 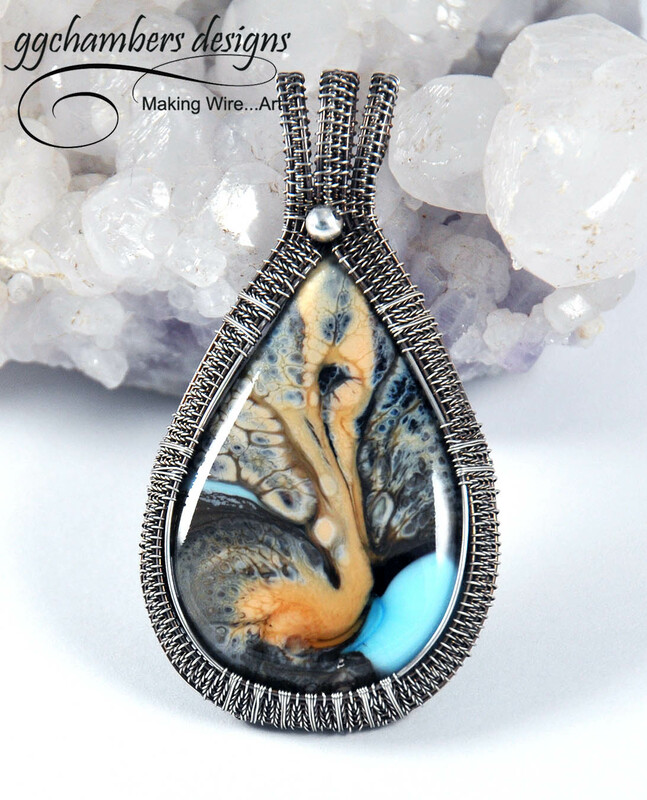 This stunning Blue Glazed Glass cabochon is encased in Gail's Feather Frame design. This sterling silver woven wire pendant is fashioned in Gail's original Swans Neck Pendant design. The focal point is a gem quality AAA Larimar oval cabochon and two Larimar beads. They are accented by the sterling silver seamless beads, twists and curls. 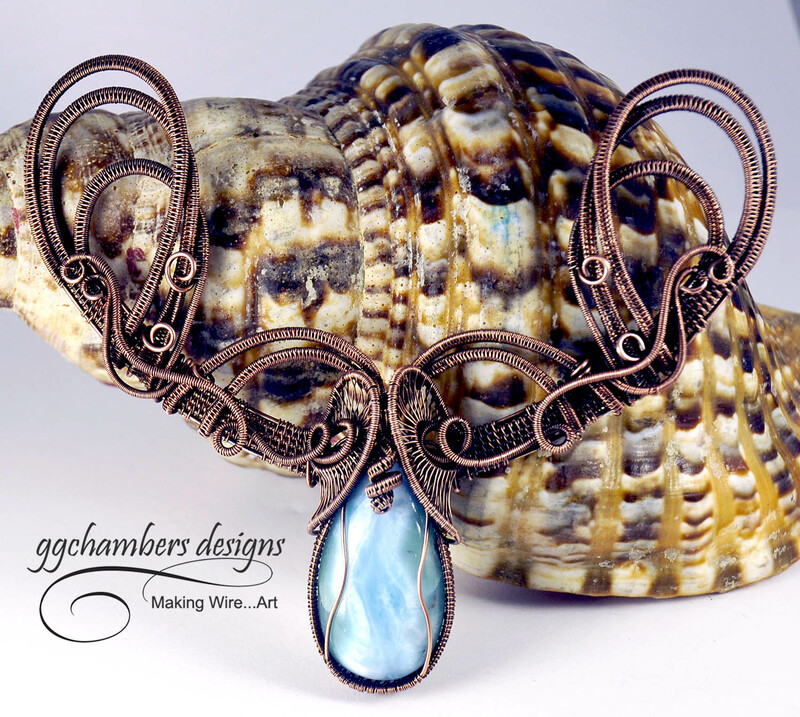 This one of a kind necklace is created in Copper and is from Gail's newest work - the Wire Helix Princess Series. The focal point is a stunning Larimar Oval cabochon. Congratulations to Gail on such beautiful work! You can follow Gail on all of her social media channels. Visit her Website. Read her blog: wirewrapperblog Follow her on Twitter and Facebook: You can also Pin her on Pinterest, and shop her tutorials on Etsy. 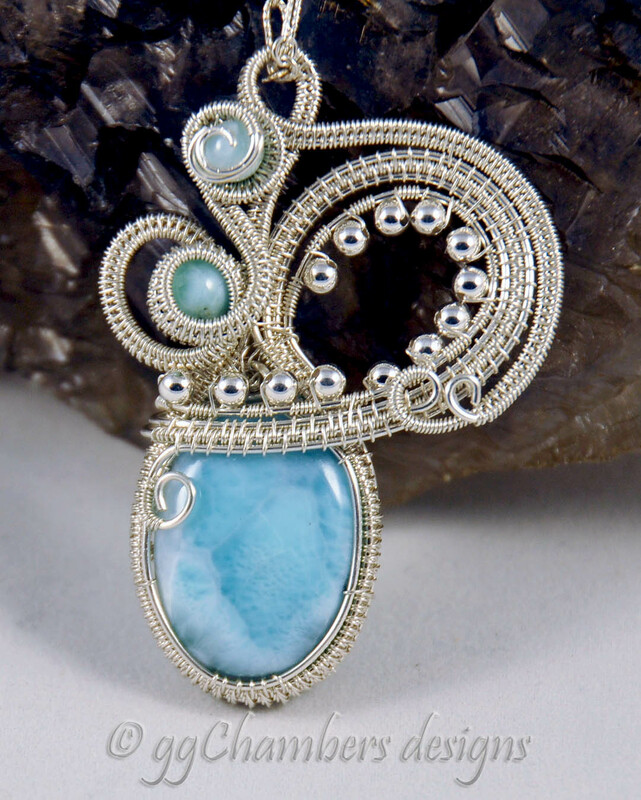 Each month, we pick a talented wire jewelry artist and their work to highlight. We know we have some incredibly talented customers, and we seek to encourage and highlight those members of our community by highlighting one wire artist every month. Would you like to be featured on WireJewelry.com? Click here for our Wire Artist of the Month Submission Form.